Contacts have two uses in NodePing. They are used to manage notifications. They are also used to manage access to your account on the NodePing web site. You can give different contacts different access levels, depending on whether you want them to just receive notifications but not login, view account information and results, or manage your monitoring checks and contacts. Contacts are managed on the Contacts tab. To edit an existing contact, click on their name. To add a contact, click on "Add new contact." Enter the person's name in the Name field. Their name will be used on lists and for adding notifications. Then enter an email address or phone number. You can set multiple addresses or phone numbers (there is no limit) by clicking "Add another," or you can remove them by clicking "Remove." 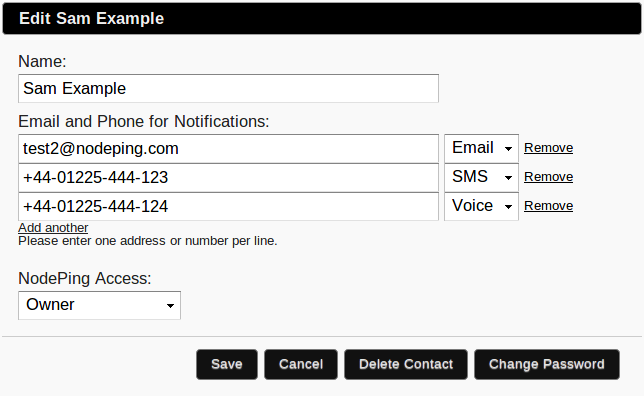 When you set up notifications, you will be able to select individual addresses or phone numbers for each notification. The service includes International SMS notifications. For numbers outside of North America, enter the number using the +country code notation. SMS across regions is challenging because it depends on the arrangements between the various mobile providers. If you enter a mobile number and don't get notifications, contact support and we will do what we can to get the notifications working. In most cases after contacting the various mobile providers we can get them working. However, there is no guarantee that SMS will work with all providers in all countries. "Notifications Only" does not allow the contact to log into the site at all, but they can still receive notifications. "View" allows them to login to the site, and view check information and results. "View" access does not allow them to make changes to your site monitoring checks. "Edit" lets them create and change contacts, contact groups, and checks. "Owner" lets them do what "Edit" does, plus manage subaccounts, branding, and billing information. Contact Groups are used to group contacts, making them easier to assign for notifications. To add a group, go to the Contact Groups tab and click on "Add new Group." Give the group a name, and add people to it using the Add Members drop down. To remove someone from a group, click "Remove" next to the contact you want to remove. You can have any number of groups in your account, and groups can have any number of contacts in each group.